We decided to spend New Years in the Lake District this year as well, almost the start of a new tradition! This time Sara and Björn decided come along, flying in from Sweden. We found a lovely little cottage just outside Coniston, a perfect starting point when driving to the different hike locations. The first day we decided on a shorter hike, as a warm up, and as the weather forecast said fog, we didn’t want to get lost on high altitude. We decided to revisit the Wray Castle hike along Lake Windermere, which we did last year as well, but since Sara and Björn hadn’t seen it we decided it was a good warm up. Ended up an 8km hike with great views over the lake and with fog shrouded fells in the distance. What’s that? A Black small sheep with a red coat? Day two gave us more fog, but we decided to not let it stop us. In our hiking book we found a 12 km circular hike which started in Grasmere and went up to Blea Rigg. Besides a total ascent of 703 metres, fog, wind and rain, and a slight 1km detour, we had a great day out and we got some brilliant dramatic views over the fells. The first day of the new year was a wonderful day with blue skies. Unfortunately, Björn and Sara caught a cold and weren’t feeling up to a long hike, so Maddie, Simcoe and I headed out on our own for a day on the fell. We found a 10.5km hike, about 30 minutes from the cottage, starting in Ambleside. 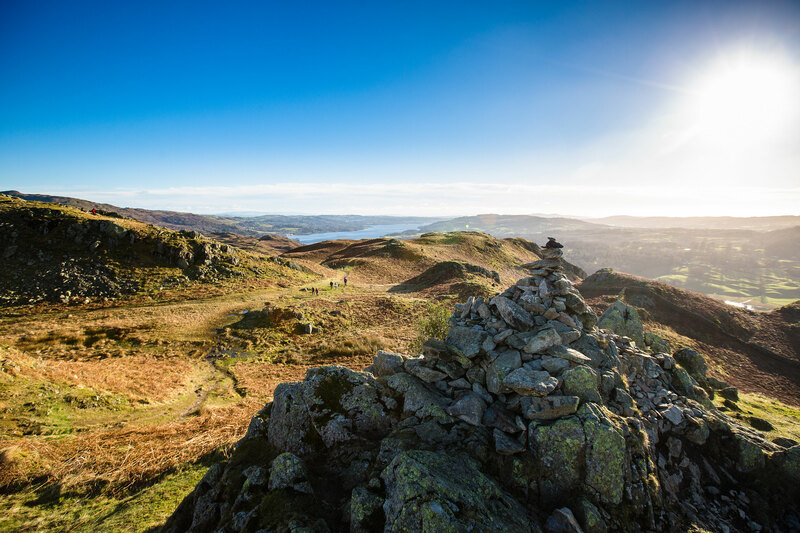 We had a lovely day with a total ascent of 515 metres, stunning 365 degree view from Loughrigg fell, a beautiful detour and a surprise cave we weren’t expecting. A perfect way to start the new year. All in all we had a great stay in the Lake District. The cottage outside Coniston was quaint and perfect for the five of us. I doubt this will be the last time we visit the area, but next time I’ll want to go in spring or summertime.